Little is actually known at this time about the Garvan carver. Below is an article from the New York Times that quotes Alan Miller, one of the foremost experts on the Garvan Carvers work. 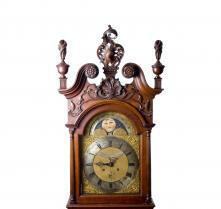 Alan authenticated this clock as one of the Garvan Carvers earliest works in 2005. “Ten or fifteen carvers inhabited the small world of Philadelphia cabinetmaking in the late 1750's. Some of these men worked at shops on Second Street and some worked at home. Many of them had known the Garvan carver since he began his career, perhaps at 14, as an apprentice. One can tell from a carver's work whether he was born in England or America, Miller says. When the labor of a carver trained in England first appears on a piece of Philadelphia furniture, it shows evidence of someone who is already highly skilled -- a man, as Alan Miller puts it, "who's got his running shoes on." The Garvan carver's work first appears on objects made sometime a round 1750, and its appearance reveals a young hand learning its craft. To make a living at carving, a man needed a trick, a method of solving technical problems -- like the way the rail joins the knee of a table in an ogee curve at the same time it curves outward. As Alan Miller explains, "Since he has to move fast in order to make money, as any pieceworker does, he needs a way of attacking these things." All carvers evolve a vocabulary of images that belong to no one else. The images are like voices so distinctive that one carver may recognize another's work from across a crowded room -- just as Miller recognized the Garvan carver when he entered the office at Sotheby's. As the Garvan carver improved his skills, his vines soon began to look like no one else's. His claws became his own. In this carver's world, every leaf looked as if it had grown fat from summer rains and was turning to face the sun. His flowers seemed to have only just then bloomed. When you examined these images closely, each one seemed to have a purpose. His world made sense. The Garvan carver's work grew so accomplished that rivals soon began to imitate his twisting leaves and vines. Miller discovered copies of the carver's technique on things made in other shops. He even found exact reproductions of the carver's designs on work done inside his own shop. But the copy "doesn't make sense," says Miller."